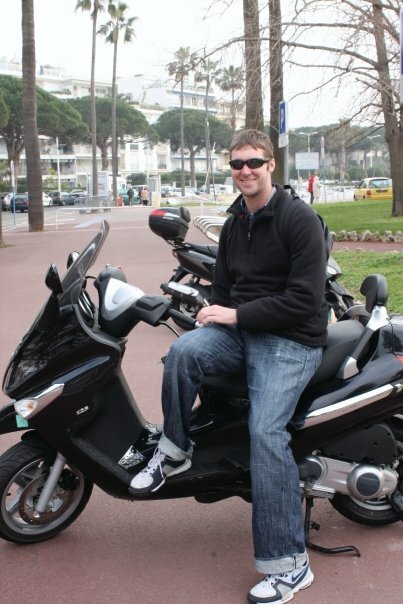 While Shelly and I were in the French Riviera we decided to check out, and see if we could rent, a scooter. We had previously thought about this many times in different locations, but due to not finding a shop or being scared to death, we avoided the situation. In Nice, France we stayed at a hotel that was located about 2 blocks away from a scooter rental shop. Why not try to scooter up and down the French Riviera? And Shelly was the one who suggested it! Once we got our scooter, and Shelly on the back, we took off for a quick spin to try out the new wheels. Boy it was fun, but very scary. Driving in a foreign country on a two-wheeled bike is both exciting and thrilling. It is hard to navigate certain areas, especially if you cannot read the language very well. Luckily, we had GPS that guided us most of the way. After a quick bite to eat, we decided to head over to Cannes. The ride was amazing because it was on a highway next to the beach. It was very pretty and seemed straight from a movie. Traffic was not bad at all and we were flowing smoothly. Then we came to an intersection where we could not decide which way to go. We chose Blue wrong decision. Blue means the French Interstate. I saw the speed limit of 125 Km/Hr and tried to convert it in my head as cars were whizzing by us at a high rate of speed. Shelly, after about a mile on the interstate, very calmly stated that I should probably take the next exit. Very wise words of wisdom that I took to heart because I will now only follow green signs in France, unless in a car. Once we got into Cannes we had a great time viewing the big boats in the marina and walking/scootering up and down the sandy beaches. During our walk, we decided that our scooter needed a name. We decided to name it Excelsior after the name of the scooter model, and South Park. 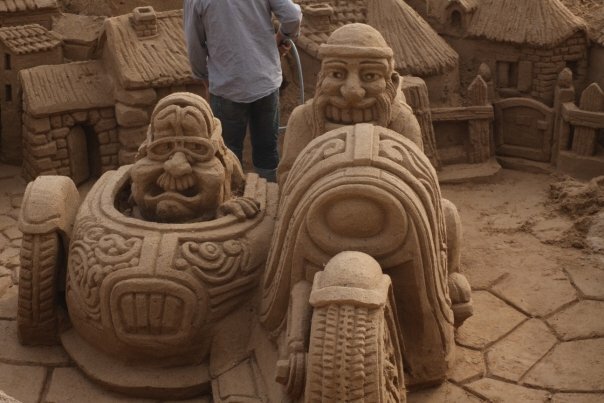 One really cool thing we saw in Cannes was a guy making a sand sculpture of 2 people riding on a motorcycle. How fitting for our little adventure. Shelly had a great idea, ice cream on the beach. She saw a Haagen Dazs about 2 blocks away from where we were, so we got some ice cream and sat on the beach. The beach was wonderful and calming. And highly entertaining when a little boy pulled down his pants and proceeded to pee on the beach, near the water. I wanted to start filming, but Shelly said it may be illegal in some states. So we just laughed that his parents just watched him and did nothing to stop him. 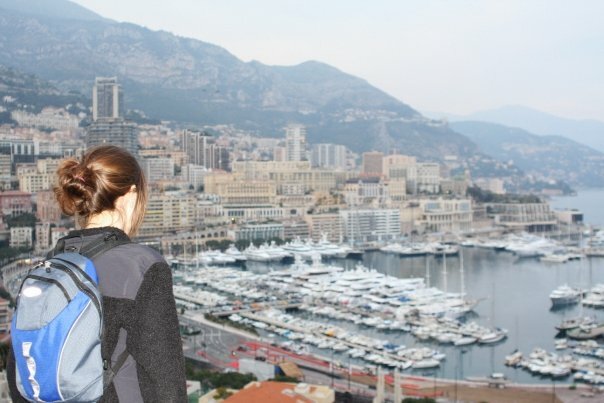 Following our adventure to Cannes, we went back up to Nice to grab some more clothes for our ride back to Monaco. But we failed to grab enough clothes. All of a sudden, Shelly just stopped talking. I thought she fell off, but it turns out she was freezing. It took her about an hour to warm up after the hour long ride. during the warming up process, she twisted her ankle and started cursing at Monaco and their curbs. It turns out that Monte Carlo is a ghost town at night, and everything was closed at 8 pm. Even restaurants! We thought people here ate late, but not in Monaco. We walked around for two hours taking some cool night pictures of Monaco. During the picture taking process, we were looking for restaurants as well. We finally found one, a pizzeria. We basically lived off pizza in France and Italy, but once it hits your lips it is so good. Shelly had an idea of driving slower on the way home, it actually worked and made the ride enjoyable and calming. Did I mention I am a genius? I had hand warmers that Shelly dug out of my bag. But anybody going to the French Riviera, we suggest renting a Vespa because it is better than sitting in a train, makes you feel very independent, and is very picturesque. Shelly is a costumer on movies and Andy dwells in cubes. Traveling is a way for us to be by ourselves and a way to escape work. The best thing about travel is the excitement it creates and the joy of not knowing what will be around the next corner. We like trying new things all the time and do not want to have a "normal" life.